Retractable awnings for decks, porches, and patios offer an ideal solution for outdoor shade. Screened-in enclosures, on the other hand, while they provide much desired protection from sun and many weather conditions, do not offer the kind of flexibility that many homeowners seek. Retractable awnings allow you to choose how much sun exposure or shade you'd like, and adjusting them is usually fast and easy. Knowing a little more about them can help you make the best decision when it's time to purchase. 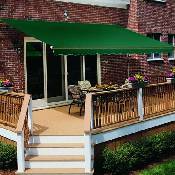 Retractable awnings are either manually operated or motorized. One of the more obvious advantages of manually operated awnings is that they require no electricity to operate. If an electrical outlet is not conveniently located near the awning, it doesn't matter. These awnings come with a hand crank that should allow you to fully open the awning quietly and smoothly in less than a minute. Motorized awnings, on the other hand, come with a specialized motor and remote control which allows you to easily open and close the awning from the comfort of your seat or even from inside your home. They plug into any standard outlet, so a visit from the electrician is not required if an outlet is located close by. The clear advantage of motorized awnings is that they offer convenience, but they may also be a better choice for homeowners who have physical limitations that would prevent them from using a hand crank. Finally, accessories for retractable awnings, while they may not come standard with the awning, should be available to purchase so that you can customize your awning for additional comfort and protection. A wireless wind sensor is one handy accessory to consider for motorized awnings if you happen to live in an area that experiences occasional high winds. The sensor will automatically close the awning if winds become strong enough to potentially damage it. Another helpful accessory is a screen panel that can be attached to the side or front of manually operated or motorized awnings to create even more protection from sun, wind, rain, or other weather conditions. Yet another practical accessory is an awning cover that protects retractable awnings when they are closed and not in use. The cover helps keep awnings clean and free of dirt, cobwebs, leaves, and other debris.